(AFP) - When the prayer memorial ended in Christchurch, Ahmad Khan stood shoulder-to-shoulder with three Maori men in traditional dress as they all stuck out their tongues. 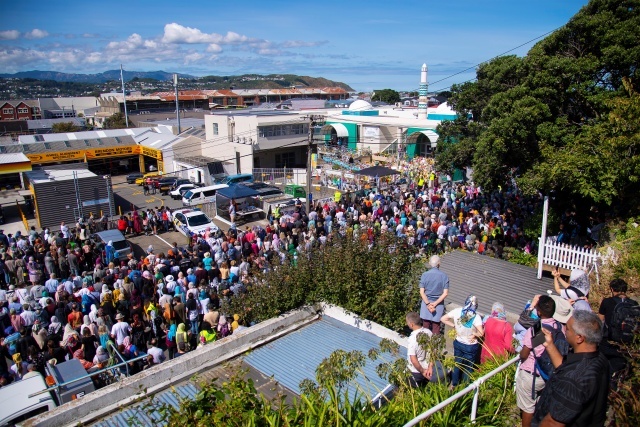 "It's unbelievable looking at the crowd here, thousands of people gathering behind us during prayers," said Khan, a 36-year-old businessman who flew down from Auckland to attend the service. "It's a feeling of rejoicing." Joy might seem like an odd word for someone who hails from a community that just had an unimaginable atrocity committed against them. The killings began only a short distance away at the bloodstained Al Noor mosque, which is still shuttered to the public. But Khan said he was buzzing. No longer was his community isolated, shunned or viewed with suspicion. The memory of those lost was, of course, painful. But for now, he wanted to bask in that newfound community spirit. A queue of worshippers waited for pictures with the three Maoris -- men in prayer caps and long tunics, veiled women and young children squealing with delight as the trio put on their most frightening war faces. The crowd reflected the sheer diversity of those affected by last week's devastating attacks. At the front, divided into male and female sections, where those hit the hardest -- thousands of Muslim worshippers facing the mosque for prayers, including survivors and relatives of those killed. It looked much like any outdoor Friday prayer session. But what made the gathering so extraordinary were the thousands of non-Muslims behind them. There were families from across New Zealand, biker gang members standing guard, Maoris in traditional attire, and priests in clerical collars. New Zealand Prime Minister Jacinda Ardern also attended, as did a self-declared wizard clad in flowing robes and a pointed hat. Some brought guitars and sang songs. Others held placards. One banner held by two people next to where Muslim men were washing ahead of prayers simply read: "We support our Muslim neighbours." Instead of mourning in black, most women wore bright headscarves, creating a kaleidoscope of colour. Many of those attending said New Zealand had been forever changed by the murders -- but in a way that would only bond people together. "The country is united in this and nothing is ever going to break it," Christchurch local John Dale, 59, said, accompanied by his partner Shirley, who had decided to wear a white headscarf. "We'll stand behind each other -- anyone. Muslims, Christian, any religion." Mohamed Nadir lost his brother Mohammed Daoud Nabi, the 71-year-old gunned down reportedly greeting his killer with the words "hello brother". As he knelt down during the two minutes of silence, Nadir started to weep. The woman kneeling next to him, Alaska Wood, rested her hand and forehead on his shoulder. "They're hurting, they need us, so the least we can do is to stand beside them," Wood, a Christchurch local, told AFP. "There's only so much we can do. But if it's little acts of kindness, they will snowball into big acts. It's the only way things will change." Hasma Adeeb, 23, had tears streaming down her face as she was hugged by a series of well-wishers. Her father Adeeb Ahmed Sama was shot twice in the massacre, diving on top of her twin brother Ali. She described the huge number of non-Muslim women wearing headscarves for the day as a "beautiful" gesture. "Today we really did feel the support from everyone. New Zealand has been amazing. Just having everyone by our side -- it truly means a lot to all of us. It's beautiful, so thank you." Soon after, she was embraced by another person.